Braden Askew (.394) led the Sandites in offense with two hits, two runs, and two RBI. 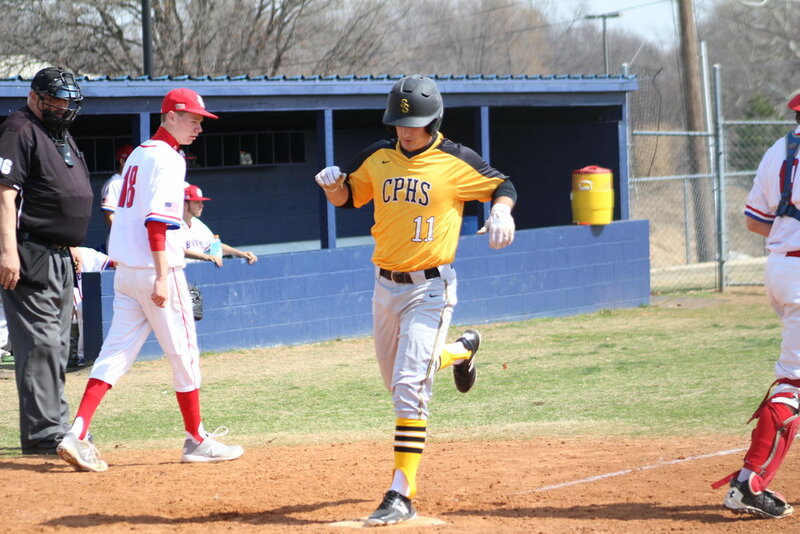 The Sand Springs Sandites won their eleventh game in a row Thursday afternoon in Bixby, run-ruling Muskogee High School 10-0 in the first round of the Spartan/Tiger Turf War. The Charles Page High School baseball team (15-6) has been on a roll lately, and Seth Villines (1-0) kept them that way by pitching a no-hitter in his first time going the distance on the mound. Cal Watkins scored on an error in the first inning, then three-straight singles from Braden Askew, Malachi Burks, and Braden Millican scored Riley Rutledge, Askew, and Burks for a 4-0 lead. Rutledge singled in Tyler Ash in the second inning, then scored on an error in the top of the fifth. Askew singled in Cale Savage, Millican scored Askew and Burks, and Brock Youngblood scored Millican for the double-digit lead. Sand Springs will return to action Friday at 3:30 p.m. against Jenks (10-10) and at 6:00 p.m. against Bixby (14-6). The Roughers (3-16) will play Bixby Thursday at 3:30 p.m. and Jenks Friday at 1:00 p.m.